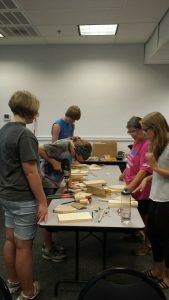 Roanoke, Va., (July 14, 2017) — MB Contractors is a proud supporter of youth STEM programs in Southwest Virginia. 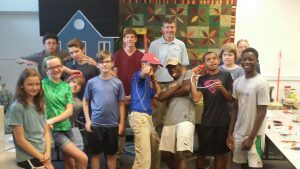 Most recently, MB was a supporter of Teens Build, a camp hosted by Habitat for Humanity in the Roanoke Valley. 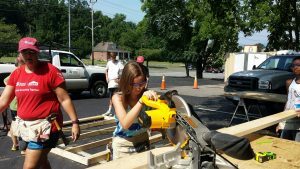 This three-day camp takes teens from 12-15 years old and introduces them into the world of construction. 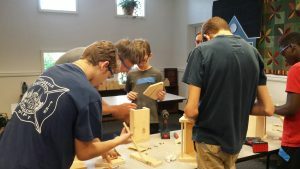 While teaching them hands-on skills and supervising the use of power tools, the teens worked on projects at HVAC, Plumbing, and Electrical trade stations. The largest project incorporated their creation of wall panels, to which a shed was built and given to a Habitat for Humanity recipient. This event attracted numerous teens, and brought the attention of Kristina Montuori of WSLS 10 TV, who took part in multiple projects and broadcasted the noon weather live on-site. The camp’s purpose is for boys and girls to experience the world of construction and to emphasize the need for skilled trade positions. The camp was held at Habitat for Humanity in the Roanoke Valley on Melrose Avenue.